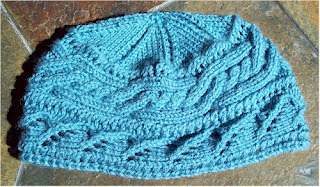 Knit Up & Dye Podcast, Yarn & Knitting Patterns: "Brandy at Sea" PDF Pattern Available! "Brandy at Sea" PDF Pattern Available! At long last, "Brandy at Sea" is active and available for purchase. For this hat,I created a stitch to represent rolling waves, and matched it up with a lovely Aran stitch that just makes me think of the twisted rope netting you see in old pre-wire wooden lobster traps. It has a little bit of a lacy feel, created through simple yarn overs, representing seafoam and spray. I think this will be a lovely addition to any ocean lovers wardrobe! 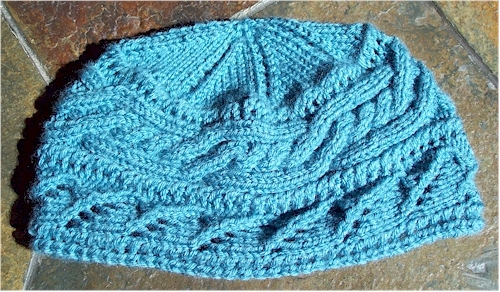 "Brandy at Sea" has been posted to my Etsy store, MyKnits.com and Ravelry.com for sale. Both MyKnits and Ravelry provide automatic delivery / download of the PDF file upon receipt of payment. Etsy sales will receive an email containing the PDF file directly from me.If you are interested in purchasing "hard copies" please email me!